Cake baking is best when it can be deeply enjoyed – no pressure of time; no interruptions; and no requirement that it turn out perfectly. Just relaxed time in the kitchen and the bringing together of beautiful ingredients to create something wonderful. This chocolate cake was the result of a holiday afternoon baking session. The house was filled with the rich aroma of dark chocolate and coffee, and it was a gorgeous way to spend time on a rainy day. It’s a very simple cake to make, but really needs the best ingredients – dark chocolate with at least 60% cocoa solids and real dutch process cocoa, organic eggs, real vanilla extract, and a really good espresso. It is very rich so a small slice is plenty. Serve it for dessert with some thick cream, and a perfect flat white on the side. Preheat the oven to 160 C. Line the base of a 22 cm diameter spring form tin with silicon paper, and lightly grease the sides with a little butter. In a medium sized glass bowl melt the chocolate, butter and cocoa over a saucepan of simmering water. Add the espresso, vanilla and a pinch of salt and stir until silky smooth. In another medium sized bowl whisk together the eggs and sugar until well combined. Stir in the almond meal and then the chocolate mixture. Pour carefully into the prepared tin and bake for 45 – 50 minutes. The edges should look a little crispy and the centre should be just set. After 10 minutes carefully remove the outside of the tin and leave to completely cool. The middle of the cake will be fudgy and squidgy and sumptuous – and a rich, dark brown. Serve in smallish slices with a little thick cream on the side. Wonderful recipe! Can’t beat a fabulous rich chocolate cake. 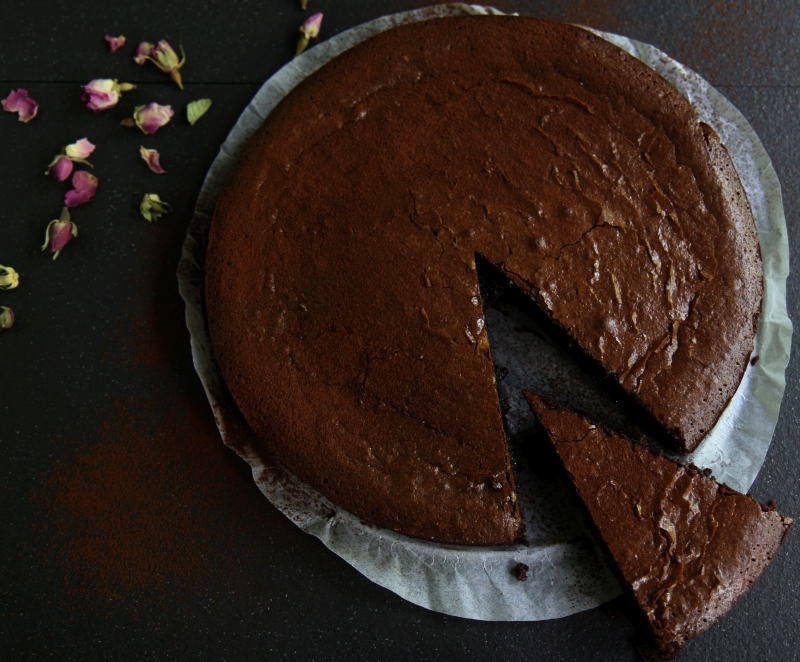 This is the recipe I have been waiting for…we craved a chocolate cake in our nest this weekend…happy feasting. great pictures on this blog! This looks like a fabulous recipe. This looks absolutley divine 🙂 i love the photos!